Tired of tedious town simulators taking up your time? Develop dream dwellings down to the last brick and construct cityscapes crawling as far as the eye can see in this stimulating simulation game! Compete with other towns in the rankings, or take it easy and go at your own pace. Build houses to have people move into your town, then add shops and lots of other facilities, making it a vibrant, lovely place to live. Stores like the bike shop or car dealer will sell vehicles to your residents, allowing them to travel further and visit more places. Acquire more areas as your town grows, discover new facilities to build, help the residents find new jobs, plan the town down to the last detail to make sure it's convenient for everyone... There is just so much to do! Once you get settled into your town, try co-op mode, which will enable you to team up with other players and build towns together. 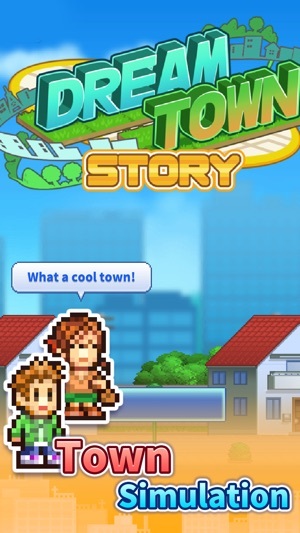 If I wasn't busy making more amazing games, I'd be playing Dream Town Story all the time! Try searching for "Kairosoft" to see all of our games, or visit us at http://kairopark.jp/. Be sure to check out both our free-to-play and our paid games! 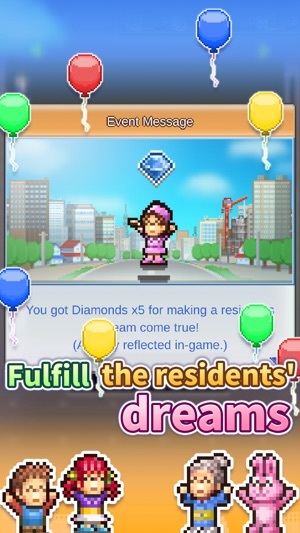 Kairosoft, Back at it Again! This game is amazing! Not only does it have the look and feel of the classic games (Pocket Clothier, World Cruise Story, etc.) but it also takes great elements from several of the games and COMBINES THEM! 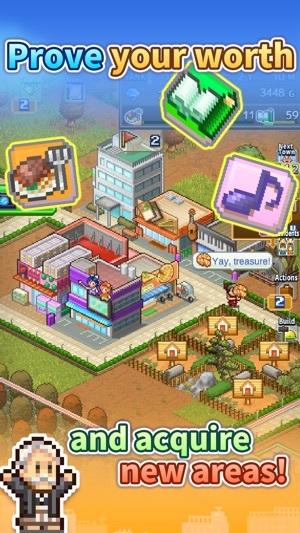 This game has outside transportation (the bus stop and subway similar to Mega Mall Story), A Town building setup (Venture Town), personable residents and marriage (Dream House Days), House and Building upgrading (Beastie Bay), Region unlocking (also Beastie Bay), and a tiny bit of rpg/strategic fighting when completing challenges (Also Beastie Bay)! Not only does this game have all of these amazing features, but it has ONLINE MULTIPLAYER! But that’s not all. This game has all of the best features of the free and pay-to-play classics... FOR FREE! 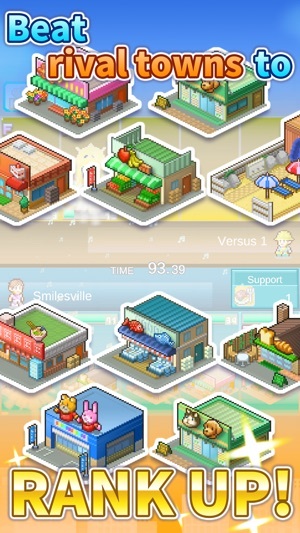 Just a little suggestion Kairosoft: Seriously make this game pay to play! 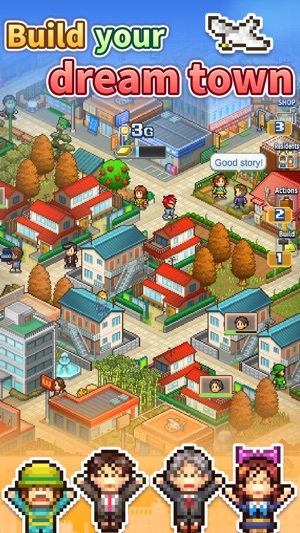 I would say this is one of the best Kairosoft games so far and you should definitely get it! Oh, did I mention, the ads are tiny, not annoying and at the bottom of the screen similar to in Beastie Bay! Even the ad you see at the beginning of the game is easy to skip (just press the top right corner, it always works even if there isn’t an X there). If you’re reading this and unsure whether or not you should get this game... YOU DEFINITELY SHOULD! I rarely leave reviews for games but I just couldn’t help myself with this gem! Kairosoft‘ sure free games are still very much playable and fun. I haven’t bought any in app purchases, yet I’m still able to play on and on for hours! It’s also very easy to save up diamonds over time. The ads aren’t a nuisance at all (They only pop up at start up and in game ads are optional). Kairosoft has been very generous in which the ‘free’ version is still p much your typical full Kairosoft simulation game. The only thing I’d change is the price of the premium package! I know a lot of work goes into these games, so I don’t want to unacknowledge that, but I don’t know if I would be able to drop 13 bucks on a simple mobile game. There are games with more gameplay and replayability around the same price, like Stardew Valley (14 bucks). don’t know if I can justify the current price, but if you ever decide to have a sale, I’d love to buy and support Dream Town Story! Thanks to Kairosoft for another fun and lovable simulation game! I want to say that although it is another freemium game, I feel something different. Building stuff requires time or dollar based diamonds, but you can always choose waiting cause there are so many other things to do while waiting. Lottery system is another feature I always hate but in this game it is kinda tolerable, as even you get the same building 10 times you can still plan how to building them and get benefits. Social system in Kairosoft games is something I never understand but in this one it is also showing a certain level of meaningless, as you can finally challenge ‘friends’. In all, I see overall progress in this game and I believe Kairosoft is on a right track. Thanks for all the efforts and fun you brought to us.